Included below are homes for sale in Scripps Ranch. If you would like more information on any of these Scripps Ranch real estate listings, just click the "Request More Information" button when viewing the details of that property. We can provide you with disclosures, past sales history, dates and prices of homes recently sold nearby, and more. And, if you haven't already, be sure to register for a free account so that you can receive email alerts whenever new Scripps Ranch houses come on the market. When searching Scripps Ranch homes for sale you will find it was discovered in 1890 and originally a humble twelve hundred acre ranch owned by newspaper publisher E.W. Scripps. The natural landscape and arid climate reminded E.W. Scripps of Algeria, North Africa. Reminiscent of North African architectural design, E.W. 's estate was named Miramar after a castle in Trieste, Italy. Some of E.W. 's trees still stand today at the Scripps Ranch Swim and Racquet Club off of Aviary Drive. Centrally located in San Diego, Scripps Ranch is located east of Interstate 15, North of Marine Corps Air Station Miramar, and South of Poway. Scripps Ranch has around twelve thousand housing units, well respected schools, abundant trails, and parks. Lake Miramar has a picturesque pet friendly five mile paved flat loop for biking, walking, and running. 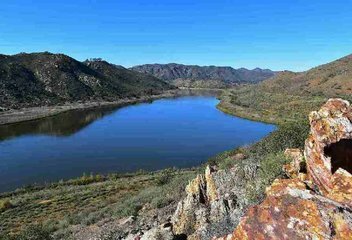 The Miramar Reservoir is located within Scripps Ranch and offers recreational boating and fishing. Along Pomerado Road you will see many mature eucalyptus trees. Every Saturday residents can find the Scripps Ranch Farmers Market at Ellen Browning Scripps Elementary School. Scripps Ranch even has it's own annual fair, running eighteen years! The elementary schools are Dingeman Elementary School, E.B. Scripps Elementary School, Jerabek Elementary School, and Miramar Ranch Elementary School. The Middle school is Thurgood Marshall and the High school is Scripps Ranch High School. Scripps Ranch premier neighborhoods include Lakepoint, Stonebridge, Sanctuary, Stonebridge Estates, Chantemar, Warmington Collection, Waterford at the Lake, Scripps Preserve at Stonebridge Estates, Arbors, Terraza Scripps Highlands, Sanctuary at Stonebridge Estates, Serenity, Toll Brothers at StoneBridge, Crown Collection, Warmington Viscaya, Fairbrook Estates, Bellasario, San Angelo, Autumn Ridge, Tiempo and Loire Valley. When searching Scripps Ranch condos for sale you will find condos & townhomes sell extremely fast in Scripps Ranch with a days on market average of less than 25 days. Therefore when an opportunity arises a buyer must act decisively and make sure their financing is secured well in advance. There are a wide range of condos and townhomes for sale in Scripps Ranch. Scripps Ranch has a number of single story options, as well as two and even three story townhomes. Affinity is a two hundred forty unit, three story condominium community located on Affinity Court and was built in the early 1990s. The condos are single story with two to three bedrooms, garage, fireplace, in-unit laundry, and private balcony. Community amenities include a pool, spa, and recreation area. Homeowners association fees include water. Formerly called Monarch, Allure is a gated townhome and apartment community located on Scripps Ranch Blvd and was built in 2002. The townhomes are single story with a detached garage, in-unit laundry, fireplace, and private balcony. Community amenities include a pool, barbecues, and exercise room. Homeowners association fees include water. Campton is a one hundred fifty two unit twinhome community that was built in the 1990s. The twinhomes are two stories with two to three bedrooms, an attached garage, fireplace, laundry, and patio. Community amenities include a pool and spa. Streets include Caminito Festivo, Caminito Sereno, Caminito Alegra, Caminito Brioso, and more. Canterra is a one hundred thirty five unit gated townhome community located on Scripps Poway Road and was built in 2002. The townhomes are one to two stories with two to three bedrooms, attached garage, and private balcony. Community amenities include a pool, spa, and playground. Cypress at Scripps Ranch is a one hundred seventeen unit townhome community located on Cypress Canyon Road and was built in 1999. The townhomes are two stories with two to three bedrooms, an attached garage, fireplace, private balcony, and yard. Community amenities include a pool, spa, and barbecues. Glenwood Springs is a one hundred twenty unit condominium community that was completed in 1982. The condos are two stories with two to three bedrooms, an attached garage, patio, and fireplace. Community amenities include a pool, spa, and tennis courts. Homeowners association fees include water. Ivy Crest is one hundred thirty three unit condominium community that was built in 2000. The townhomes are two stories with a two car garage and fireplace. Some models will have either a private balcony and/or patio. Community amenities include a pool, spa, and playground. Ivy Hill is a one hundred thirty three unit condominium community that was built in 1998 and completed in 2000. The townhomes are two stories with a two car garage and fireplace. Some models will have either a private balcony and/or patio. Community amenities include a pool, spa, and playground. Homes are located on Ivy Hill Drive. Le Chateau is a small twinhome community that was built in 1983. The twinhomes are one to two stories with two to three bedrooms, fireplace, garage, balcony, and/or patio. There are no homeowners association fees. Meadowbrook is a twinhome community on Cypress Canyon Road and has over seventy units. Completed in 1999, the twinhomes are two stories with two to four bedrooms, an attached garage, fireplace, in-unit laundry, and patio. Community amenities include a playground. Miro is a large condominium community located on Miro Circle and was completed in 2002. The condos are two stories with two to three bedrooms, a garage, fireplace, and private balcony patio. Community amenities include a pool, spa, barbecue area, and playground. Nob Hill is a one hundred eighty four unit Cape Code style gated townhome community that was built in 1989. Located on Scripps Ranch Boulevard, the townhomes are one story or split level with two bedrooms, a garage, fireplace, and balcony. Community amenities include a pool and spa. Promontory is an eighty unit gated condominium community located on Caminito Vista Serena and Caminito Vista Pacifica and was built in 1988. The condos are single story with two to three bedrooms, a garage, laundry room, and patio. Community amenities include a pool, spa, and recreation room. Rancho Scripps is a thirteen unit condominium community located on Aviary Drive and was built in the 1970s. The condos are two stories with three to four bedrooms, vaulted ceilings, garage, and a large patio. Community amenities include a pool and spa. Homeowners association fees include water. Scripps Cove is a forty unit twinhome community located on Glencreek Circle and was built in 1987. The twinhomes are two stories with two to four bedrooms, an attached garage, laundry room, fireplace, and backyard. There are no homeowners association fees. Scripps Legacy is a twinhome community that was built in 1995. The twinhomes are two stories with two to three bedrooms, an attached garage, and yard. Community amenities include a pool and spa. Scripps Mesa is a condominium community located on Erma Road and was built in 1984. The condos are single story with two bedrooms, fireplace, and patio. Community amenities include a pool, spa, recreation room, and gym. Homeowners association fees include water. Scripps Townhomes is a one hundred sixty four unit townhome community located on Scripps Vista Way and was built in the 1990s. The townhomes are two to three stories with two to three bedrooms, a fireplace, garage, and private patio. Community amenities include a pool, spa, and tennis courts. Scripps Westview is a one hundred seventy six unit condominium community located on Scripps Westview Way and was built in 1984. The condos are single story with two bedrooms and a fireplace. Community amenities include a pool. Homeowners association fees include water. Scripps Woods is a one hundred fourteen unit condominium community that was built in 1979. The condos are single story with two bedrooms, fireplace, and two private patios. Community amenities include a pool and spa. Homeowners association fees include water. Smoke Tree is a fifty unit townhome community located on Aviary Drive and was built in 1978. The townhomes are one to two stories with three bedrooms, private patio, attached garage, fireplace, and laundry. Community amenities include a pool, spa, and barbecues. Homeowners association fees include water. Terraces at Scripps Ranch is a condominium community with over ninety units and is located on Scripps Westview Way. Built in 1989, the condos are single story with two to three bedrooms, fireplace, and patio. Community amenities include a pool and spa. Homeowners association fees include water. The Grove is a one hundred forty six unit townhome community that was built in 1973. The townhomes are one to two stories with three to four bedrooms, patio, balcony, fireplace, and garage. Community amenities include a pool. Timberlane is a condominium community with over one hundred units and was built in 1978. The condos are two stories with two to four bedrooms, fireplace, large patio, and garage. Community amenities include a pool, spa, and clubhouse. Homeowners association fees include water. Triana is a two hundred forty nine unit condominium community located on Spruce Run Drive and was built in 1997. The condos are two stories with two to three bedrooms, garage, fireplace, and patio. Community amenities include a pool and spa. Village Woods is a one hundred fifteen unit condominium community that was built in 1973. The condos are one to two stories with two to four bedrooms, garage, and private deck. Community amenities include a pool and spa. Windchime is a twinhome community that was completed in 1996. The twinhomes are two stories with two to four bedrooms, an attached garage, fireplace, laundry room, and yard. Lakepoint Scripps Ranch is a collection of custom luxury residences above the Miramar Reservoir. Rarely available for sale, and with quick market time when listed, Waterford luxury homes have panoramic ocean and Mirimar Lake views. Tiburon at StoneBridge Estates was developed by Cornerstone Communities in 2007-2008. Tiburon is a collection of fifty four residences with three floorplans ranging from four thousand three hundred forty five square feet and five thousand nine hundred fifty five square feet. Tiburon homes are located on Almond Orchard Lane and Wheatland Place.